Hurricane Issac in bouncing around in the Atlantic Ocean between Africa and the Caribbean. As of today, it is a Category 1 storm projected to impact St. Thomas Friday morning with Category 1 or 2 winds or, with luck, tropical storm force winds from a near-miss. Normally a Category 1 or 2 storm (think Katrina or Sandy strength) is no problem for us. It's just a day or two off from school or work. However, in September 2017 we were hit with two Category 5 hurricanes (200+ mph winds) in just ten days. We had 95% destruction and are still recovering. (I only got internet back 4 months ago). Government infrastructure, however, is at high risk of being destroyed as it is still being repaired. Additionally, there is no place to evacuate to, so those who can are taking in residents living in homes unrepaired from last September. None of my properties suffered any damage in those storms or any previous. So, I am not worried about damage. I do have to batten down doors and windows and secure roof items such as solar panels and WIFI antennae. Thus, I will go offline on Wednesday at noon. If the storm is not serious, I should be back by the weekend. However, if our weakened communications infrastructure is hit again, it may be months before I have communications restored. Just letting ya'll know so you do not think I have abandoned the site. See you on the flipside. ...Good luck fella, to you and everyone else who is anticipating this latest "Hit"! My thoughts will be with you and hope it works out for you and your fellow islanders. When I was there is was beautiful and tranquil, lets hope the islands returns to that soon. Thanks. People are a bit on edge around here. With another hurricane due to hit the US East Coast the day before Issac gets here, our supply line has already been cut off. Que sera, sera. or as Spock would say: "Have faith that the universe will unfold as it should". Thanks for your concerns. Fingers crossed. The island did lose land mass into the Atlantic Ocean during last year's hurricanes, but this storm is only a fifth as strong as those. We've also learned that the rain forests, stripped brown and leafless during big storms, turn thick green again in about three to four months. So, we get back to 'pretty-pretty' for tourists very fast, even before we find shelters for all victims. (That's a good thing ... tourist spending helps us rebuild). Hatches battened and I just trailer-ed my boat on land for good measure. Thank you. All prepped and shutting down internet in 60. The good news (so far) is Issac has reduced to a tropical storm (74 mph winds). It has, however, picked up speed. We will begin getting winds Thursday afternoon instead of Friday morning. We'll keep a careful eye out. 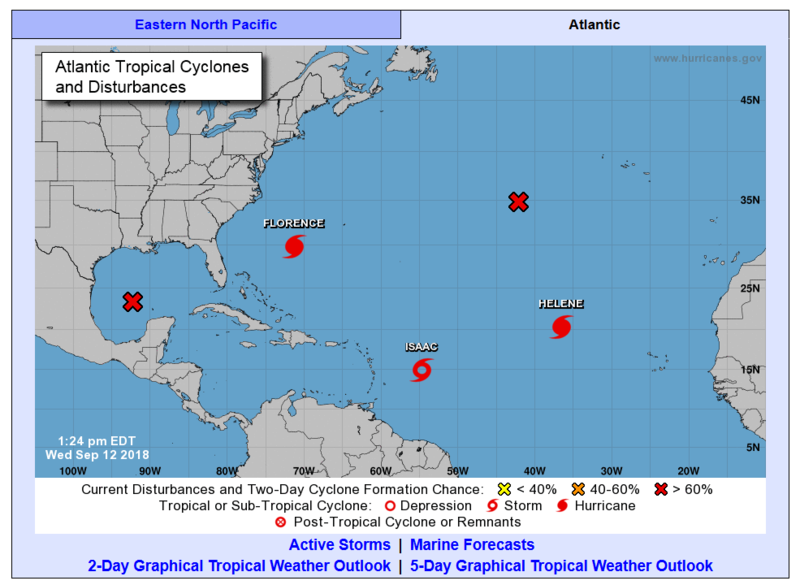 There are FIVE systems in the Atlantic and Gulf right now: Two hurricanes, one tropical storm and two tropical remnants. Put the WIFI antennae back up this afternoon. Storm dipped south, center will pass 120 miles away. We're getting 20 to 30 knot gusts right now, expected to pick up to 50 knots tonight and tomorrow. One inch rain expected. That's well within equipment tolerances. I'm running on battery reserves, though, until I reattach my solar panels. Thanks everyone for your concerns and well wishes. I think you scared the storm off. Now to pray for my fellow countrymen in Guam and the Carolinas.